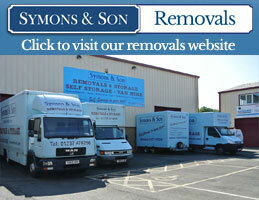 Symons & Son thought of an idea of making self storage easier for you by delivering storage to your door. We are a friendly & helpful business offering a service tailored to your individual needs. We know how stressful moving into storage can be & our aim is to make things go smoothly & stress free as possible for each & every customer. We can store your belongings to suit your requirements - for a few days, weeks, months or even years. Denise will be happy to explain our storage and answer any questions. 1 - We deliver our mobile storage unit to your home in our custom built trailer. 2 - Loading is easy and convenient and can be loaded in your own time. 3 - We collect the trailer and store your contents in our modern building, full access available whilst in storage. 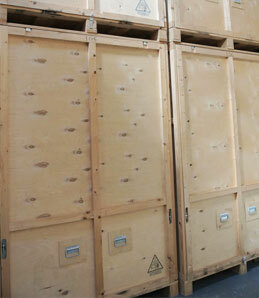 Symons & Son can provide storage containers for the secure storage of your office equipment, stock or furniture. Storage on a short or long term basis to suit your requirements. Symons & Son provides innovative compartmentalised records storage solutions for today’s businesses, hospitals, solicitors, accountants, and charities. Off site archive and records storage will save you money, time, and space. Symons & Son’s use of custom built storage containers guarantees the safe secure storage of your records, and the ability to accurately access your chosen records fast. Only your records are kept in your storage container. Symons & Son will collect your records in our mobile storage containers from your chosen location; this service ensures absolute confidentiality and accuracy when loading your container. Once loaded and sealed the container is returned to our storage centre for safe keeping. We can provide all the materials needed when packing and moving. For more information, please visit our packaging page.